Click here to download the Conference Mailer. Fill in the form below to let us know you are coming or call the FGA Main Office at (610)857-2357. The Registration Fee of $39/person may be given through our donation page, or mailed to the Central Office. Friday Lunch and Saturday Breakfast are included with your registration. For more details, check back here soon and watch out for your summit notice in the mail. 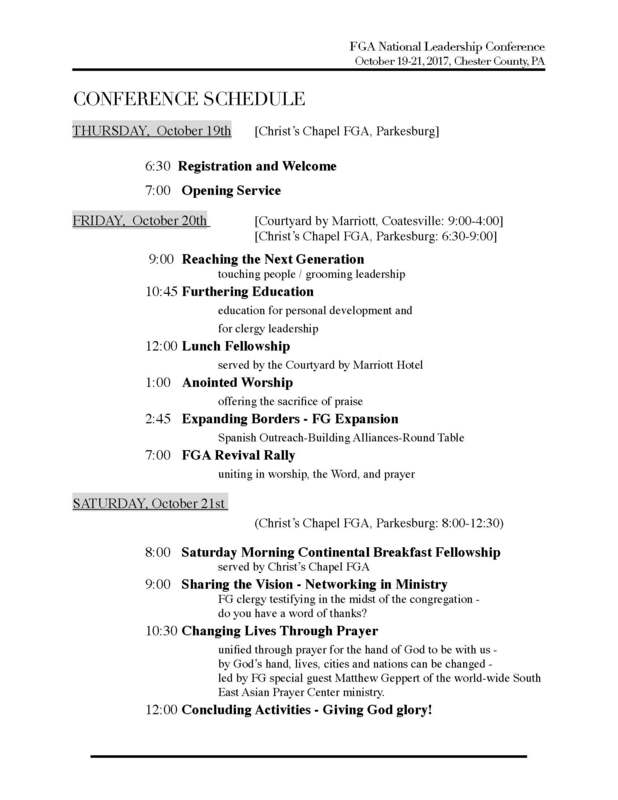 The Friday morning and afternoon sessions will be held at the hotel, while the Thursday and Friday evening, as well as Saturday morning sessions are going to be held at Christ’s Chapel FGA. It is a 7-mile / 11 minute drive from the hotel to the church. Check back here for more updates on the summit and watch for your summit notice in the mail!